Mr. George Michael "Mike" Smith!!! Mike is pictured above with his beautiful wife and travel manager, Ms. Lara Heidtman-Smith. 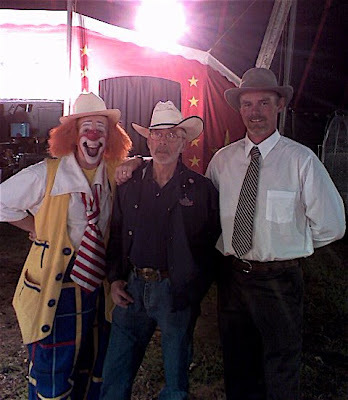 Next Thursday Mr. Smith joins the Kelly-Miller's Clown Alley and will become the second American circus clown in 40 years to work for a member of the Ringling family. Mr. John Ringling North II and family return to the Emerald Isle today but the Kelly-Miller Circus America's One-Ring Wonder forges on to Grand Saline, TX. Both shows in Athens yesterday were sellouts and we couldn't have asked for a bigger sendoff for the Norths. If they had to go, last night was the one to go out on! You see, John Ringling North II wears this hat. Here he is surrounded by a bevy of beauties knows as the North Stars.. I don't know what he'd be surrounded by if he bought himself the Stetson "Open Road" that Wade insists he requires to be taken seriously, but I'd like to see a photo of the type of ladies up there at the Cuneo barn who are attracted to Wade's Flying J trucker cap. And I didn't buy mine because of Art Concello, Hoxie Tucker, Sophie Tucker or any circus boss. 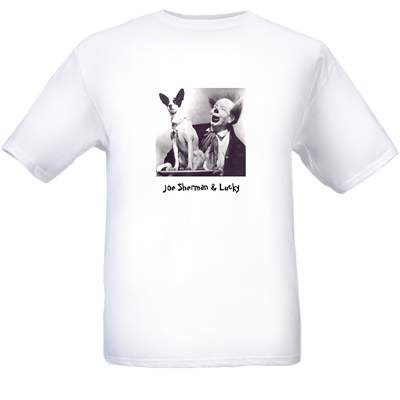 I bought mine because "The Great One" wore the "Open Road" when he played Sheriff Buford T. Justice of Texas! In case you are unaware... he had his son Junior hold it for him because he was in H O T P U R S U I T! Me, John Ringling North II and Casey Cainin McCoy. I just found out that a good friend, a great clown, and a fellow fool passed away yesterday. Phillip Steven Harris died on Friday 3/28. He was 60. Steve also spent some time working at Circus World in FL. Performing as a silent mime/clown he performed his one-man show "Professor Effluvium's Poppycock Review" all over the Southeast. Steve also taught countless school children the art and joy of circus thru his teaching residencies in Circus Arts thru the South Carolina Artists In Education program. Steve was a very old and dear friend of mine and one of the very early influences in my career and becoming a professional fool. He lived his life to the fullest and made many people, old and young, laugh in his lifetime. He leaves two beautiful children behind along with his ex wife, Sarah (who just happened to be one of our first booking agents). Here's a pic of Steve performing his signature rolla-bolla trick, using an old giant wooden flywheel from a steam engine for a roller instead of the standard PVC type roller. He is mid way thru passing his body thru the hoop. A classic routine that Steve performed with great flair. 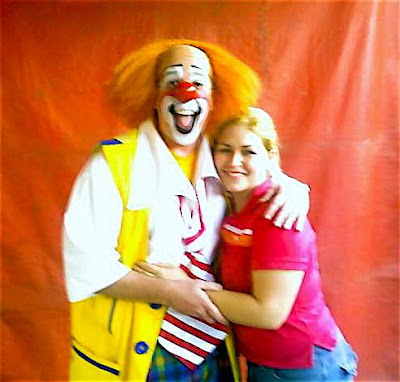 I would love to see you recognize him on clownalley.net, if possible. 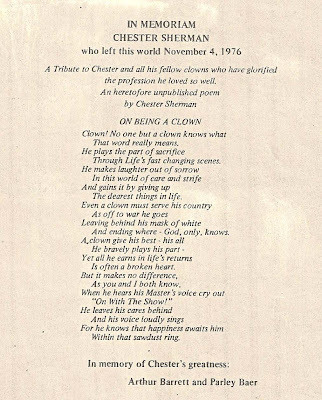 There are many clowns out there who knew Steve and would like to know of his passing. Best wishes for a safe and fun tour. 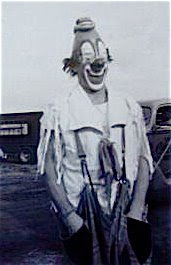 For those of you out there who are still unsure as to what a "picture clown" is, meet Mr. Keith Crary. 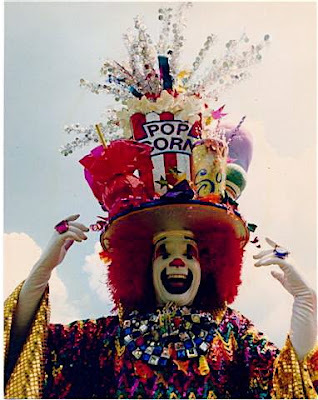 This is a photo of Keith from the 1985 Great Circus Parade in Milwaukee, WI. Now Keith is not going to be taking any slaps, doing any falls or taking a pie in the face in this outfit but you can't deny that he looks like a million bucks in it. His picture in the paper or featured on a circus poster is guaranteed to get noticed. That is a "picture clown". 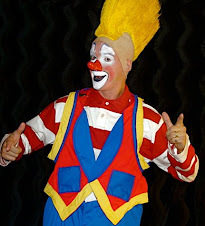 It doesn't mean that you can't be funny, it simply means that you are a great looking clown. America's Favorite Circus Producer, Mr. John Ringling North II brings America's One Ring Wonder to Athens, TX for two shows. Doug Terranova, Louie De Morale and their crew came by last night. I got to talk with Louie during the afternoon but only spoke to Doug briefly during the intermission. After the show Doug was on a phone call while I sold my brand-new Stetson "Open Road" knockoff to Casey Cainin McCoy. I got a business call after the transaction that required I leave the lot, check into my room and get online ASAP, so I didn't get the chance to kick back with the legendary Mr. Terranova. A big announcement as to who will be replacing me here at Kelly-Miller will be made tomorrow. Raul (last year's K-M clown) is having problems with his H2B visa, and I have another commitment booked, so circumstances nessecitate that we bring in one of the "big guns". Check back tomorrow to see who it is. Today? Looks to be mostly rainy. Time to break out the "alternate wardrobe". 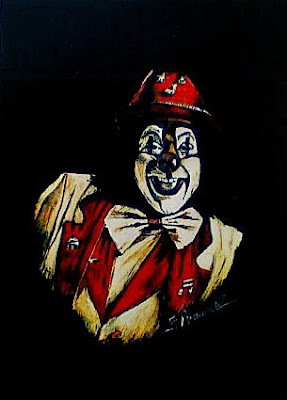 My friend Louie De Morale stopped by the show last night and was gracious enough to share this portrait of his uncle, Ringling Clown College class of '69 graduate and much beloved "road clown" Manuel Marcos "Zapata" Barragan Jr.
My, how times (circuses, clowns, wars, public attitudes etc.) have changed. That's Yuri Nikulin but I'm not sure about the partner. It's possibly Mihail Chuidin. 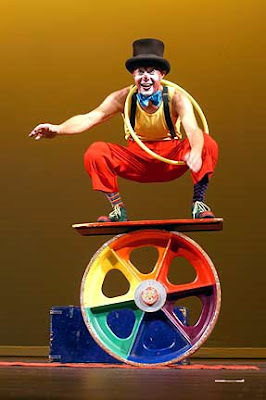 America's Favorite Circus Producer, Mr. John Ringling North II and America's One Ring Wonder, his Kelly-Miller Circus, roll into Balch Springs, TX today for two performances. 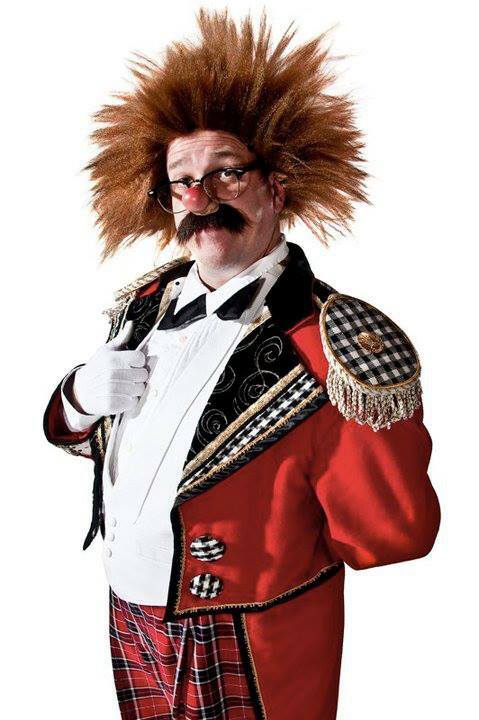 Congratulations go out to Mr. North as Kelly-Miller has been confirmed as the circus selected to play the Great Circus Parade's triumphant return to the city of Milwaukee, WI next year. Kelly-Miller was also blessed yesterday morning with a the addition of a beautiful, healthy new foal who is up, around and eager to join the Loyal riding act (who took the day off to celebrate). 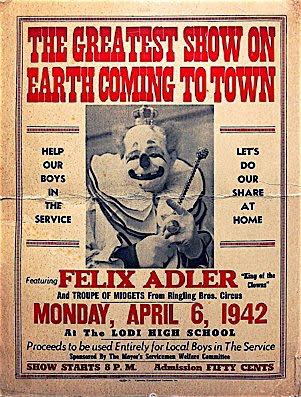 I had the chance to ask Mr. North about some of the clowns that he remembered from the classic Ringling Alley and if he could confirm or deny the rumors surrounding some of them that have sprung up over the years. Other than Frankie Saluto's eagerness to fire anyone who crossed him, he refuted all of them. Each and every one. "Sorry I couldn't give you more dirt", he told me. I told him that I was hoping that there wouldn't be any dirt anyway and that liked his version much better. "No, I never saw or heard of any of the stuff that you're talking about, and I knew them all pretty well. They were all just a great bunch of really nice guys, hardworking... loved what they did. Just like you." Which was one of the greatest compliments that I think that I've ever received. So despite what the Belgians might think, John Ringling North II thinks that I'm OK. When I asked him yesterday at the cookhouse if he'd seen Showbiz David's write up on him he smiled and said that he had but his only comment on it was, Hey, what's wrong with our website?" 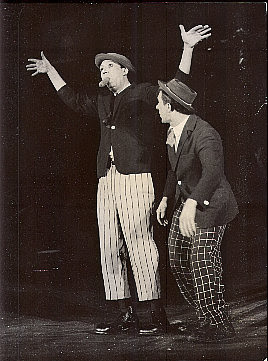 KENNETH WAITE TROUPE: Early Chester and Joe? 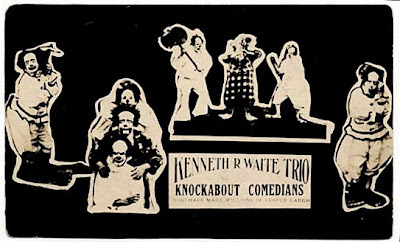 I was reading that Chester Sherman and Joe Vani met with Kenneth Waite to form the K. W. trio. I found this postcard of said trio. 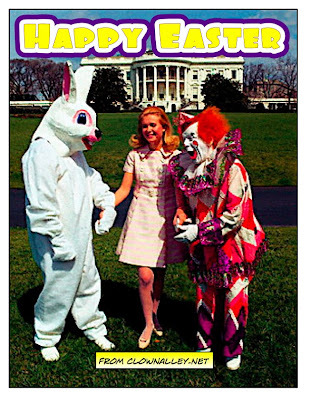 Do you think the two other clowns in it are the Sherman Bros? I don't know. Anyone out there have any idea? And here's Charlie portrayed in a new film. This looks about as historically accurate as a movie on the assassination of Archduke Ferdinand starring Johnny Knoxville, Coolio and the Rockettes but I'd still like to see it anyway. 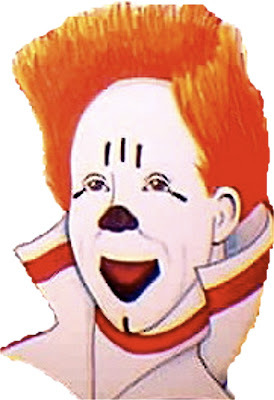 Why is it that they went to great lengths to get Charlie Rivel's look down while missing the mark entirely on the other clowns and the sets? It's not like there aren't photos around that would show you what a circus and a clown in Germany would have looked like in 1944. Was Rivel even in Germany by '44? I'm pretty sure that he'd been forced to make Akrobat Schoon and then taken his family and fled long before that. John Ringling North II's killer-diller, no filler, bigger-than-Michael-Jackson's-Thriller Kelly-Miller Circus rolls into Palmer, TX today where America's One Ring Wonder will give two powerhouse performances. Things are still going great here. 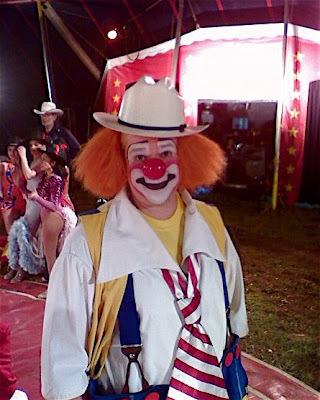 For a circus clown there is simply no feeling of existing in complete quintessence in this entire world like quietly doing your makeup in the back of a show truck in the late afternoon sunshine as the breezes make your costumes dance on their hangers. Check out Showbiz David's recent article on the show and Mr. North by clicking the title of this post. Just a reminder to get your votes in by midnight on Monday for this year's Felix Adler Awards. Voting has been heavy so far, but far more fragmented than last time so, especially this year, every vote counts! To clear up some misconceptions: You do not have to be an American clown to be nominated! You just need to have performed in the United States between 1/1/07 and 12/31/07. 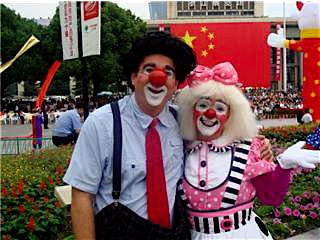 Performances by American clowns who have worked overseas are also eligible. Also, I am very flattered to have been nominated but I am not eligible to win in any category, so please don't vote for me. I'll only ask you to recast your vote. 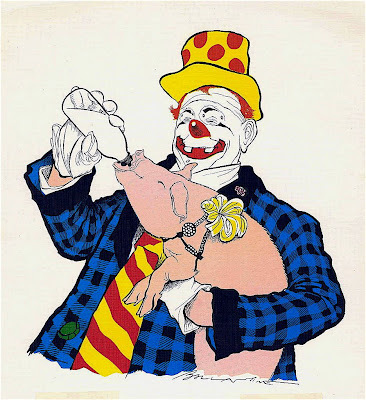 And finally, you do not have to be a professional circus clown, American or otherwise, to vote. Anyone can cast their vote. So make sure that your votes are sent to cashincomedy@mac.com by midnight on 3/31! Much love to Mr. Tom Dougherty who gave clownalley.net a shout out in his recent profile in the New York Times. Thank you, sir! You are both a featured clown and a gentleman. To view the article please click the title of this post. 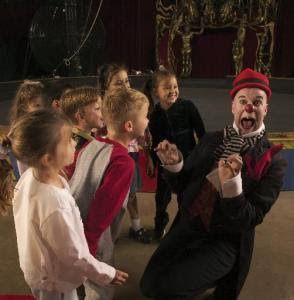 The World's Oldest Professional Circus Clown passed away on Good Friday, March 21 http://www.ireport.com/docs/DOC-5402 . 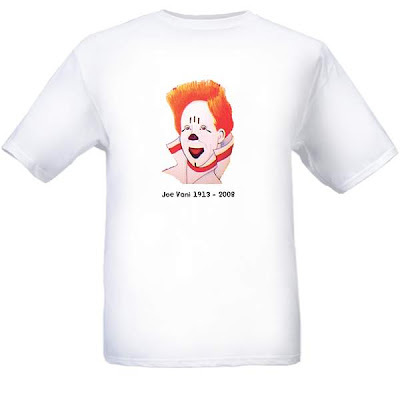 With the family's permission and blessing, Joe Vani's friend Art Bausman is helping raise funds for Joe's funeral expenses by selling Joe Vani t-shirts. I'm sending Art a little check today to help out - you might want to do the same. 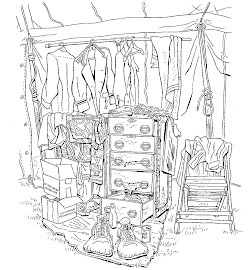 Until you've sat in a chair at the back door, listening to the music for your cue and watching a beautiful sunset over a wide expanse of open country, you really don't know just how idyllic the life of a circus clown can be. 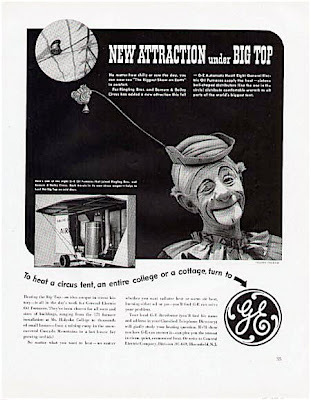 A magazine advertisement for GE featuring Gijon Polidor of the Ringling Bros. and Barnum & Bailey Circus. 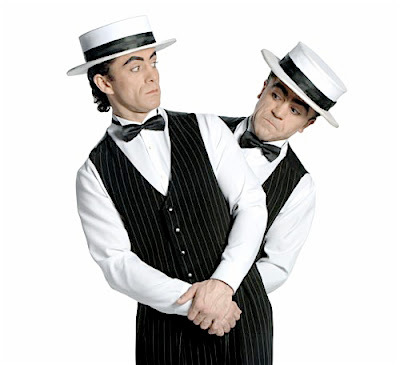 A new strong comedy acrobatic act with all the splendor of the good old days. To view their video please click the title of this post. John Ringling North II's Kelly-Miller Circus, America's One Ring Wonder, continues to circle the Dallas/Ft. Worth area with two shows today in White Settlement, TX. Showtimes at 4:30 and 7:30. Last night we had light, yet enthusiastic, houses in Rhome but it was a Monday and it was the day after Easter so it's just about what we expected. I forgot to mention that Gary "Patches" Ray (cc '72) stopped by on Saturday. I wish that I'd had more time to talk with him. 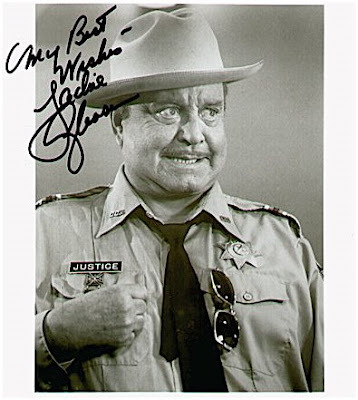 I have a million questions for him about the shows he was on back in the day. Also, I've got to try to get a picture of Mr. North's new hat. Wade Burck is gonna plotz! They'll be calling him "SMS Burck"! I am the funeral director handling the Funeral arrangements for Mr. Vani and I had seen on your blog you were looking for information about arrangements. The family has asked that if you could please post this info on your blog it would be greatly appreciated. Also if there are any other blog or web pages that you know of to help get the message out pertaining to Joseph's passing please forward the info to them. PLEASE repost this anywhere and everywhere that you think that Joe's friends and fans might see it! CLOWN ALLEY: Paul Jung & Co.
Paul Jung and Company, outside the backdoor of the Ringling Bros. and Barnum & Bailey Circus under canvas in the late 40s/early 50s, waiting to go on with the Adam Smasher Gag. 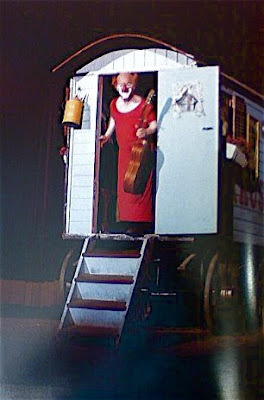 Charlie Cairoli at the Blackpool Tower Circus from the book Circus - Magie der Manege with photos by Rolf Lehman and text by Fredy Knie, Sr., Horst W. Cekan & Lutz R. Schoellkopf, found at the Hugo Public Library. 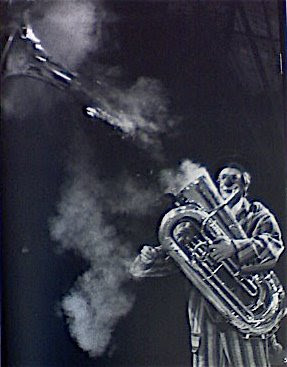 The Rastellis' exploding tuba from a book (not from the book Circus - Magie der Manege with photos by Rolf Lehman and text by Fredy Knie, Sr., Horst W. Cekan & Lutz R. Schoellkopf, another one) from the Hugo Public Library. David "Antonio" Meatchem and Rosita. A poem by Chester that I'd bet sums up Joe's feelings as well. A memorial service is being planned by Joe's great nephew, Mike Lorenz and information will be posted here as soon as it's available. If you have any thoughts as to how Mike could get out the info as quickly as possible, please let me know. John Ringling North II's One Ring Wonder, the Kelly-Miller Circus, is back from our Easter break and headed to Rhome, TX today for two performances just down 114 from the Texas Motor Speedway. Showtimes are 4:30 and 7:30 PM. Since I last updated on things here at K-M we've been to Wrightwhite, TX on 3/20 and Frisco, TX on 3/21 and 3/22. 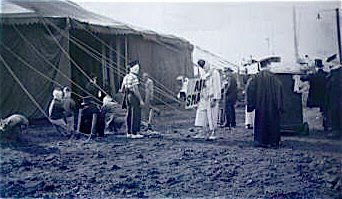 The Frisco date included visits from several circus folks including The Hall Family, Jimmy, Tepa and Elaine. Elaine is pictured a'huggin' on me at right. 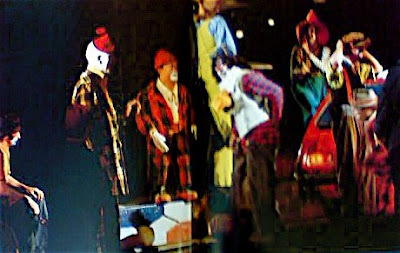 Here's a terrible cellphone camera reproduction of a great photo of the early 70s Ringling Clown Alley that I found in a European circus book at the Hugo Public Library in Hugo, OK.
From left to right I see: Billy Baker )seated on the ringcurb), Frosty Little, Mike Padilla and then after that I can't make out the faces. I know Barbara Nagel is on the right because I can make out her wig. Does anyone know which book this is from? Can anyone provide a better scan? 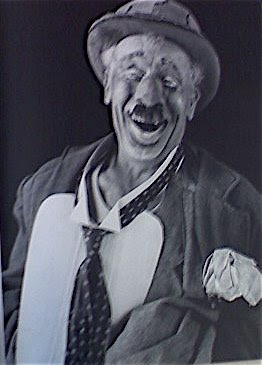 Manrico "Bario" Meschi, from a European circus book found at the public library in Hugo, OK.